The Apple Core's Jason D. O'Grady notes that the biggest news item in the news these days is the outbreak of the Influenza A(H1N1) virus, and that there's an interesting technology story about the virus that caught my eye about how the outbreak is being tracked in the US using Macs. "As the H1N1 virus continues to spread across the globe, scientists are working to stay one step ahead of it. Hoping to predict where it might turn up next, researchers are looking to the sky. "From their laboratories at the Ohio State University Medical Center, over fifty scientists work on treatments for the next major outbreak - and while they never know if it will be tuberculosis, malaria or swine flu, they will know where to find it." Macworld's Ted Landau observes that most of us would rather fix a problem ourselves than hassle with driving to an Apple Store - providing there's even one within driving distance of where you live. Macworld's Dan Moren says that a frequent complaint he hears from his Windows-refugee friends when they switch to the Mac is about that little green Zoom button in the top left of OS X application and document windows. Even some veteran Mac users find the Mac OS Finder Zoom function obtuse. For relief, Moren recommends a handy little freeware utility Right Zoom, which transforms the green Zoom button function to a more Windows-esque window maximization function and includes a handful of other customization options. Overclockers Club's Ediseye says the scuttlebutt is that sometime this June, Nvidia will be releasing the GeForce GTX 285 for Macintosh users, presumably featuring similar specs to the PC version, such as the 648 MHz core clock speed, as well as the 240 processor cores that are used on the Nvidia GPU. "One of the best-known makers of battery backups is American Power Conversion (APC). However, if you own an Intel Mac and are using a recent version of Mac OS X 10.5 (Leopard), you may want to look elsewhere for a UPS. APC devices are likely to give you grief . . . APC units don't work with Intel Macs above Mac OS X 10.5.4." Cnet's Jon Oltsik predicts that within the next 18 months, Apple will begin recommending that Mac users install Internet security software on all systems, basing his prognostication on a hunch is that Mac attacks will increase precipitously over the next year. Oltsik reasons that Mac users tend to be more affluent than the median, thus juicy targets for identity theft with fast broadband connections to the Web to hack into for increasingly diversified and sophisticated cyber-criminals, and the Mac's presence in the enterprise is growing as well, raising its profile as a target, plus, depressingly, he says that Macs are fairly easy to hack. I hope he's mistaken, but it's a caveat worth keeping in mind. Oltsik compares the status quo up to now in the Mac orbit with the days "senior citizens" recall nostalgically when they could leave their houses unlocked and car keys in the ignition switch. I actually still live in a small rural community where one can do both with relative impunity, and the freedom from the hassle of installing and updating antivirus software has been one of the great joys of Mac computing for me, and will be saddened if Oltsik is right and those days are numbered. "Disk Utility is an excellent OS X utility for managing hard drives and removable storage. If you've ever installed OS X, wiped a hard drive clean, or needed to re-format a USB stick, there's a good chance that you'll be familiar with the app. Whilst managing disk images is undoubtedly Disk Utility's forté, it can also be used to good effect for creating images. "This how-to will walk you through how simple this process is. We'll illustrate how to create a simple disk image for storing files, a few of the uses that images can have, and also investigate how images can be encrypted to keep your files secure." "Newer Technology designed its Voyager Q ('Quad') drive dock, distributed by Other World Computing, to accept laptop (2.5-inch) and desktop (3.5-inch) SATA drives that then connect to your computer via any of its four different storage interfaces: external SATA (eSATA), FireWire 800, FireWire 400 and USB 2.0." Editor's note: The graphs show the real world difference between eSATA, FireWire 800, FireWire 400, and USB 2.0, which top out at 86.9, 62.1, 35.4, and 33.6 MB/sec. read throughput on Intel Macs. FireWire 400 has a big edge over USB 2.0 with files smaller than 16 KB and shows better write times than read times, while USB 2.0 writes slower than it reads, making FireWire a better backup choice. PR: Jimdo's developers got to work right away when the news hit - figuring out some way to rescue GeoCities sites. They've launched the Jimdo Lifeboat to let users know they have somewhere to go. Over the past few days, they've finished a migration tool for GeoCities: site owners can just enter their old site URL, and the old content is imported to a Jimdo account. This isn't just GeoCities 2.0, and it's not a static archive of the site: all the pages and content can be edited and managed using Jimdo's WYSIWYG interface. There's only one side-effect . . . the sites might not look exactly the same. Some might even be prettier. The developers did did all they could, but some things just aren't transferable. While the work is only partly done, the Jimdo folks are trying to get the word out to as many GeoCities users as possible that there's a new home waiting. They've also thrown together an entertaining video. Jimdo is also working on The Jimdo Lifeboat for Google Page Creator for those using Google Page Creator, which is also shutting down in June. PR: The most advanced Online Backup Service to hit the market raises the bar for data security. BackUpMax Secure Online Backup for Mac and Windows possess an impressive and unusual feature set developed with the mobile laptop user in mind. BackUpMax backs up and restores files, but so do other services. BackUpMax Personal Edition takes a step further by allowing users to erase sensitive data remotely from lost or stolen computers and can actually help you to recover a lost or stolen computer. More than 637,000 laptops are lost each year at US airports alone according to a survey by the Ponemon Institute. A laptop is stolen every 53 seconds and, according to the FBI, 97% are never recovered. "BackUpMax Personal Edition will actually snap pictures and movies of the thief using a computer's built-in camera. It can listen to sounds in the room. It can even discover its location," explained software developer Rob Cosgrove, the founder of the Online Backup industry, "It sends all this information silently to your BackUpMax account where you can view it." Users can log into their BackUpMax accounts on the web. From there they can order their lost computers to shred files using Military-grade DoD 5220.22-M protocol. Users can also locate their computers on a map using an innovative process that does not require a GPS or other special hardware or software on the lost computer. Users can view video and snapshots, listen to room sounds, query the wireless network card and system information - all of which can help locate the computer and prosecute the thief. Of course, BackUpMax has all the normal online backup features, plus some including web-based restore, cross-platform backups and restores, user-defined backup sets, configurable file retention policy, user-defined private keys, and very high security. BackUpMax Personal Edition is for laptops and personal computers. Subscriptions start at $9.95/month for 10 GB. BackUpMax Business Edition is for Servers, and starts at $89.95/month. Only the Personal Edition contains the Remote Security Suite. PR: The Evoluent VerticalMouse 3 Wireless is an advanced third generation of the revolutionary mouse from the inventor of the handshake grip. Some users say using the VerticalMouse has relieved their wrist and arm pain. The ergonomically contoured shape supports your hand in a natural handshake position that eliminates forearm twisting. You use the same familiar grip as with an ordinary mouse, but in a vertical orientation, so almost no retraining is needed. Clicking the mouse buttons does not result in unwanted movement because your thumb naturally opposes your finger movements. The contoured black portion of the body where you hold the mouse has a polyurethane coating, allowing you to have complete control of the mouse just by resting your hand on it practically eliminating the need to grip the mouse. The buttons on the VerticalMouse take about half the force of traditional mice to click, so your fingers won't get tired with all the clicking required in today's computer applications. The button force is light for easy clicking, but still firm enough to avoid accidental actuation. The vertical scroll wheel is optical, providing improved reliability and quiet, smooth operation. Detents provide useful tactile feedback when scrolling. The VerticalMouse provides a total of 5 buttons. A thumb operated button and 3 finger operated buttons are provided. Also, the scroll wheel provides a fourth button at your fingertips. With an optical sensor at this resolution, the amount of movement required for cursor control is reduced without any loss in precision or accuracy making it perfect for AutoCAD, photo editing, web surfing or playing your favourite game. The Avago 3080 gaming grade infrared optical sensor tracks more accurately than most laser sensors on the majority of surfaces. 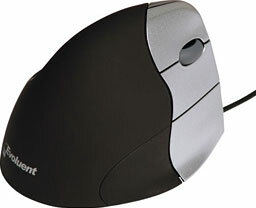 A button and indicator light on the bottom of the mouse allows you to set the resolution to 2600, 1800, 1300, or 800 DPI. A small ledge along the bottom right edge of the mouse prevents your little finger from dragging on the work surface. Cycle through as many as 3 pointer speed settings with a keyboard shortcut or mouse button. For example, use a high speed for moving between monitors, a medium speed for ordinary tasks and a slow speed for graphics work. Automatically perform a single or double click by pausing the pointer. The time delay before activation is adjustable. Press and hold a button momentarily to simulate continued pressing without holding down the button. The time delay before activation is adjustable. Set up visual and/or audio alerts to remind you to take a break. The patented shape supports your hand in a fully upright handshake position that eliminates forearm twisting. Many users said earlier models relieved their hand, wrist, or arm pain. See these actual user comments. An ordinary horizontal mouse requires your forearm to twist away from its natural position. The grip is the same as on an ordinary mouse, just turned sideways into a handshake position. Many users said they got used to it very quickly. The compact USB receiver is slim enough to avoid blocking adjacent ports. 3 month estimated battery life under typical use with non-chargeable AA batteries. The sensor never sleeps so pointer response is always instantaneous. Resolution: 1200 dpi true optical hardware resolution. Dimensions: L 4.45" (113 mm), W 3.15" (80 mm), H 3.03" (77 mm). Weight: 6.7 oz (189 g) with 2 AA alkaline batteries. PR: The VerticalMouse 3 is the third generation wired version of the popular Evoluent mouse. A small flange was added along the bottom right edge to prevent the user's little finger from dragging on the desk. Also, the scroll wheel now has tactile detent positions. A new feature added to Revision 2 of this mouse allows the user to set the resolution to 2600, 1800, 1300 or 800 DPI using a button and indicator light on the underside of the mouse. This makes adjusting pointer speed easier and further improves tracking - note the mouse is shipped with the resolution at 2600 DPI. Features similar to those described above for the wireless version. 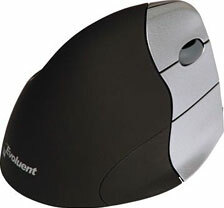 The VerticalMouse 3 is currently available in a right-handed model only, with a black housing and silver buttons. Dimensions: 4.45" x 3.03" x 3.15"
PR: The Evoluent VerticalMouse 2's patented shape supports your hand in a relaxed handshake position that eliminates forearm twisting. The mouse remains stable when pressing buttons because the thumb naturally opposes the finger movements. More intuitive/less of a learning curve than central pointing devices or touchpads. An ordinary horizontal mouse causes your forearm to twist away from its natural position, which can reduce blood flow, put muscles in awkward positions and increase the rate of fatigue. For many, this can result in discomfort and pain while mousing. The design of the Evoluent VerticalMouse improves comfort and control when mousing, with a patented shape that supports your hand in a relaxed handshake position, and provides a notch for your thumb to rest in. This innovative design eliminates forearm twisting and minimizes the effort required to use the mouse. You use the same familiar grip as with an ordinary mouse, just turned sideways, and the buttons are operated by the same fingers. That's why there is virtually no retraining necessary. The mouse does not unintentionally move sideways when clicking with normal force because the thumb naturally opposes the finger movements. Pointer control is as accurate as any other high-quality mouse. The vertical scroll wheel is optical, providing improved reliability and quiet, smooth operation. The wheel is smooth scrolling with no detent positions. With an optical sensor at this resolution, the amount of movement required for cursor control is reduced without any loss in precision or accuracy making it perfect for AutoCAD, photo editing, web surfing or playing your favourite game. 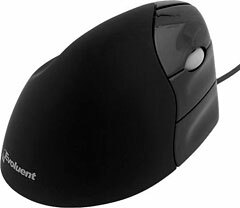 This mouse is available in a left-handed model with a black housing and silver buttons, and a small quantity of right-handed mice are still available with a black housing and black buttons.